From a spate of harassment allegations to a sexist manifesto written recently by a Google engineer, the evidence is mounting that Silicon Valley’s most successful companies are failing to create diverse, inclusive work environments. When steps are taken to level the playing field, they often leave out women of color at disproportionate rates. As part of a recent investigation, reporters Will Evans and Sinduja Rangarajan asked 211 of Silicon Valley’s largest tech companies for their EEO-1 forms, which provide a raw breakdown of race and gender across staff. The forms offer an unvarnished view of who’s at the top, and bottom, of the industry’s diversity spectrum. Any company with more than 100 employees is legally mandated to submit its EEO-1 form to the federal government on an annual basis. While they may disclose the information to the public, it’s not required. That takes a bit of encouragement – which is where you come in. Here’s how you can help promote transparency among tech’s biggest companies. How important is diversity in your workplace? Did you leave your tech company after experiencing discrimination? Were you part of an internal diversity effort? We’re collecting stories from tech employees to better understand how companies respond to questions of diversity internally. The form is confidential; we won’t share your response with anyone without your permission. It’s one thing to read that most companies turned down our requests for EEO-1 forms; it’s another to see which companies complied – and which ones didn’t – in a sortable database. We’re keeping that information up to date here, and we’ll keep updating it as new tips roll in. If your company hasn’t released its 2016 EEO-1 report, you can send it to SVDiversity@revealnews.org. There are also plenty of ways to share it securely. Social media is a powerful tool for exposing secrecy and dissecting weak excuses. As our reporters point out in their investigation, most companies have EEO-1 forms available. They are, after all, required to submit them to the government on an annual basis. Yet that hasn’t stopped several PR representatives from telling our reporters they’re too busy to share raw diversity numbers – or simply ignoring our calls. Thus, a gentle reminder: #Its1Page. 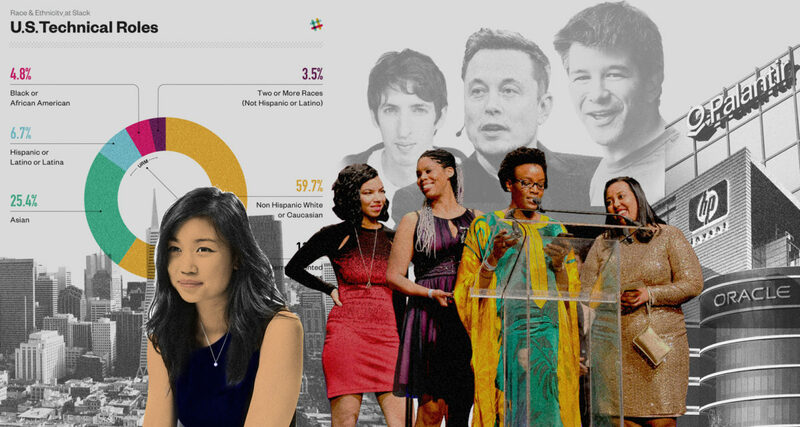 Silicon Valley’s diversity problems aren’t going away, and neither are we. If you have a story to tell, we’re always interested in hearing it. You can drop a few of our reporters and editors a note at SVDiversity@revealnews.org. And Evans (wevans@revealnews.org) and Rangarajan (srangarajan@revealnews.org) are always listening. You also can contact us securely through PGP, Signal or SecureDrop.